Whether you are enjoying the French Riviera as part of a luxury yacht charter or on your own private yacht the area has long been associated with the finer things in life. In fact according to the Côte d’Azur Economic Development Agency in one year alone this fine French area hosts 50% of the world’s superyacht fleet with at least 90% visiting the region at least once in their lives. From the trendy clubs of Saint-Tropez to the sheltered coves of Illes d’Hyeres, this seven day itinerary takes you west and away from Cannes and Monaco. Enjoy the laid back life of lazy French days as you sail along the Mediterranean Sea. Day 1: Live the highlife in Saint-Tropez Fly into Nice, and get a helicopter shuttle across to St Tropez where you will meet your yacht. 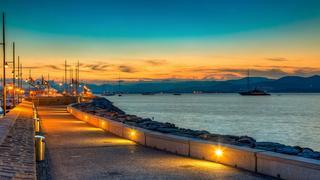 Once you’ve settled on board, go out for a stroll around this iconic port on the Cote d’Azur. Despite the fact that Saint-Tropez is heaving with visitors for much of the year, the town still retains that "je ne sais quoi" that makes it popular with the glitterati and the day-trippers alike. To make your day in Saint-Tropez complete, book a table at Résidence de la Pinède on the Plage de la Bouillabaisse. This fabulous gourmet eatery is one of top restaurants in the French Riviera and boasts two Michelin stars, so reservations need to be made some way in advance. A pleasant stroll back to the yacht and a night on the aft deck should round off the day nicely. Alternatively Saint-Tropez is one of the top Mediterranean party destinations if you want to start your holiday with a bang. Whether you are enjoying the French Riviera as part of a luxury yacht charter or on your own private yacht the area has long been associated with the finer things in life. In fact according to the Côte d’Azur Economic Development Agency in one year alone this fine French area hosts 50% of the world’s superyacht fleet with at least 90% visiting the region at least once in their lives. From the trendy clubs of Saint-Tropez to the sheltered coves of Illes d’Hyeres, this seven day itinerary takes you west and away from Cannes and Monaco. Enjoy the laid back life of lazy French days as you sail along the Mediterranean Sea. Fly into Nice, and get a helicopter shuttle across to St Tropez where you will meet your yacht. Once you’ve settled on board, go out for a stroll around this iconic port on the Cote d’Azur. Despite the fact that Saint-Tropez is heaving with visitors for much of the year, the town still retains that "je ne sais quoi" that makes it popular with the glitterati and the day-trippers alike. To make your day in Saint-Tropez complete, book a table at Résidence de la Pinède on the Plage de la Bouillabaisse. This fabulous gourmet eatery is one of top restaurants in the French Riviera and boasts two Michelin stars, so reservations need to be made some way in advance. A pleasant stroll back to the yacht and a night on the aft deck should round off the day nicely. Alternatively Saint-Tropez is one of the top Mediterranean party destinations if you want to start your holiday with a bang. After breakfast, head west from Saint-Tropez for a few miles, and drop the anchor off Pampelonne Beach — one of the best beaches in the Mediterranean. In high summer there are literally dozens of superyachts anchored here, while owners and guests go ashore on this fabulous beach to swim, paddle, and enjoy the restaurants and bars along the beach. It can get pretty crowded here in the summer, so if you like your peace and quiet you may want to move on quite quickly. Otherwise, enjoy being where the “beautiful people” are, have a spot of lunch, and then head back to the yacht for an afternoon cruise west. 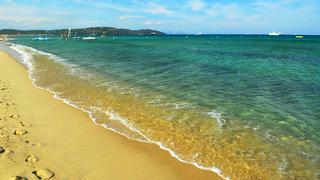 Next stop are the Illes d’Hyeres, the delightful group of islands just off the coast between St Tropez and Toulon. Drop the anchor in a sheltered cove and maybe go out in the tender to explore and swim in the crystal clear waters. An al fresco dinner under the stars is a great way to end a wonderful day. After breakfast, head west from Saint-Tropez for a few miles, and drop the anchor off Pampelonne Beach — one of the best beaches in the Mediterranean. In high summer there are literally dozens of superyachts anchored here, while owners and guests go ashore on this fabulous beach to swim, paddle, and enjoy the restaurants and bars along the beach. It can get pretty crowded here in the summer, so if you like your peace and quiet you may want to move on quite quickly. Otherwise, enjoy being where the “beautiful people” are, have a spot of lunch, and then head back to the yacht for an afternoon cruise west. 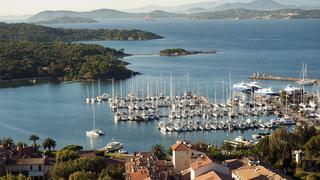 Next stop are the Illes d’Hyeres, the delightful group of islands just off the coast between St Tropez and Toulon. Drop the anchor in a sheltered cove and maybe go out in the tender to explore and swim in the crystal clear waters. An al fresco dinner under the stars is a great way to end a wonderful day. Spend the morning exploring the islands from the tender, have a leisurely lunch in a picturesque anchorage, and then head slowly westwards in the afternoon. Passing Toulon on the starboard side, you round the Ile du Gaou and find yourself just off Sanary-sur-Mer. Get the skipper to launch the tender so that you can go ashore with one of the crew, while the yacht carries on to Bandol in the next bay. Spend an hour or so exploring the delightful town of Sanary, maybe sit in one of the harbour-front cafes enjoying a late afternoon tisane and a pastry, before jumping in the tender and heading back to the yacht in Bandol. The town of Bandol is a cosmopolitan and lively place with numerous restaurants, bars, and a lively nightlife should the fancy take you. Spend the morning exploring the islands from the tender, have a leisurely lunch in a picturesque anchorage, and then head slowly westwards in the afternoon. Passing Toulon on the starboard side, you round the Ile du Gaou and find yourself just off Sanary-sur-Mer. Get the skipper to launch the tender so that you can go ashore with one of the crew, while the yacht carries on to Bandol in the next bay. Spend an hour or so exploring the delightful town of Sanary, maybe sit in one of the harbour-front cafes enjoying a late afternoon tisane and a pastry, before jumping in the tender and heading back to the yacht in Bandol. The town of Bandol is a cosmopolitan and lively place with numerous restaurants, bars, and a lively nightlife should the fancy take you. Coast-hopping west from Bandol, you will pass many typical Provencal fishing villages, small beaches, and rocky headlands. 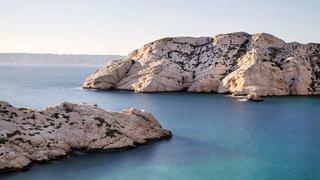 Although Marseille itself is pretty unprepossessing, there are a number of islands off-shore that are well worth a look. If anyone on board is a diver, there are numerous excellent dive sites around the Ile de Riou and Ile de Plat, in these islands are worth exploring if only for their extraordinary rock formations. Nearer to Marseille are the Iles Du Frioul, which are very pretty, and the fort there was where the fictional Count of Monte Cristo was imprisoned. 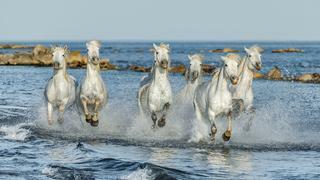 When you’ve had enough of island-hopping, set a course west and head for Port Camargue near Montpellier. Port Camargue is an ideal base from which to explore the Rhône delta and its surroundings. Coast-hopping west from Bandol, you will pass many typical Provencal fishing villages, small beaches, and rocky headlands. Although Marseille itself is pretty unprepossessing, there are a number of islands off-shore that are well worth a look. If anyone on board is a diver, there are numerous excellent dive sites around the Ile de Riou and Ile de Plat, in these islands are worth exploring if only for their extraordinary rock formations. Nearer to Marseille are the Iles Du Frioul, which are very pretty, and the fort there was where the fictional Count of Monte Cristo was imprisoned. When you’ve had enough of island-hopping, set a course west and head for Port Camargue near Montpellier. 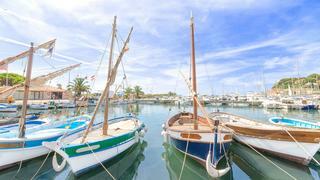 Port Camargue is an ideal base from which to explore the Rhône delta and its surroundings. Give the captain and crew a day off, and hire a car or taxi for the day. In the morning drive inland to Nimes and take a look at the astonishing Roman amphitheatre, the fabulous Maison Carree (probably the best preserved Roman temple anywhere in the world) and the incredible Pont du Gard, a perfectly-preserved three-tier Roman aqueduct. Carry on to Arles, where you will find another spectacular Roman amphitheatre, and where you also find plenty of excellent places for lunch. After lunch, join up with your guided tour of the Camargue on horseback (there are several companies that specialise in these horseback tours, but you should book well in advance). You do not necessarily have to be an experienced rider, and most of these companies cater for all ages and all levels of experience. But there is nothing more magical than riding through the Camargue in the late afternoon sun, getting a feel for this wild and beautiful place. Back at the yacht the chef will have had all day to prepare something truly spectacular for dinner. Give the captain and crew a day off, and hire a car or taxi for the day. In the morning drive inland to Nimes and take a look at the astonishing Roman amphitheatre, the fabulous Maison Carree (probably the best preserved Roman temple anywhere in the world) and the incredible Pont du Gard, a perfectly-preserved three-tier Roman aqueduct. Carry on to Arles, where you will find another spectacular Roman amphitheatre, and where you also find plenty of excellent places for lunch. After lunch, join up with your guided tour of the Camargue on horseback (there are several companies that specialise in these horseback tours, but you should book well in advance). You do not necessarily have to be an experienced rider, and most of these companies cater for all ages and all levels of experience. But there is nothing more magical than riding through the Camargue in the late afternoon sun, getting a feel for this wild and beautiful place. Back at the yacht the chef will have had all day to prepare something truly spectacular for dinner. After spending most of the previous day on shore, today is a long day at sea. Turn eastwards and head back towards St Tropez, stopping at anything you missed on the way out, or anything you particularly enjoyed the first time round. Or, just stretch out on the sundeck with cool drink and a good book, and spend the day being pampered by the crew. In the evening, drop the anchor in the lee of Porquerolles (or tie-up in the harbour if there is space) and enjoy another peaceful evening under the stars. After spending most of the previous day on shore, today is a long day at sea. Turn eastwards and head back towards St Tropez, stopping at anything you missed on the way out, or anything you particularly enjoyed the first time round. Or, just stretch out on the sundeck with cool drink and a good book, and spend the day being pampered by the crew. In the evening, drop the anchor in the lee of Porquerolles (or tie-up in the harbour if there is space) and enjoy another peaceful evening under the stars. Spend the morning having a look around the beautiful island of Porquerolles, with its fantastic beaches, beautiful forests, and its orchards of figs. In the afternoon continue east for a couple of hours before anchoring off Pampelonne Beach for one last dip and to feel the sand between your toes one last time. As the sun sets, return to St Tropez to disembark for the last time. There is still much to see in Provence, so you might consider staying on a few more days, renting a car, and seeing what else this delightful part of France has to offer. Spend the morning having a look around the beautiful island of Porquerolles, with its fantastic beaches, beautiful forests, and its orchards of figs. In the afternoon continue east for a couple of hours before anchoring off Pampelonne Beach for one last dip and to feel the sand between your toes one last time. As the sun sets, return to St Tropez to disembark for the last time. There is still much to see in Provence, so you might consider staying on a few more days, renting a car, and seeing what else this delightful part of France has to offer.